Die Brücke, a Lutheran outreach center in Leipzig, Germany, is connecting refugees and native Germans to Christ. Above: The Rev. Hugo Gevers, missionary with the Synod’s partner church in Germany, greets children outside Die Brücke in Leipzig, Germany. Bottom: Deaconess Kim Bueltmann, LCMS career missionary to Germany, and Deirdre Batiansila Christiansen, LCMS GEO missionary to Germany, greet a visitor after worship at Trinity Lutheran Church at St. Lukaskirche in Leipzig. Die Brücke serves as a bridge for many people, including refugees, children and local Germans. 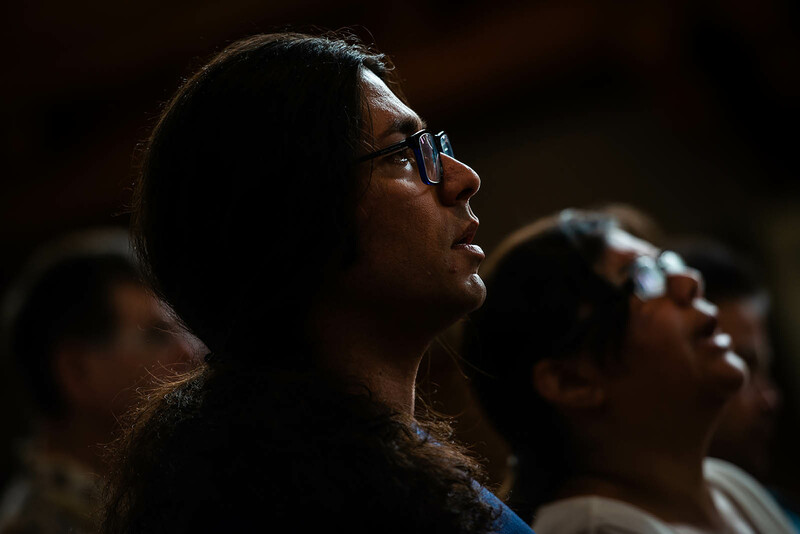 It connects refugees to the community, brings refugees and German members of the congregation together, and — most importantly — joins people to Jesus. Voices shaped and honed by hardship and suffering join together in praise of the One whose death redeems sinners. Ahoura, Atefeh and Bijan, refugees from Iran now living in Germany, sing in Persian harmony, using original words mixed with Iranian tunes and rhythms. 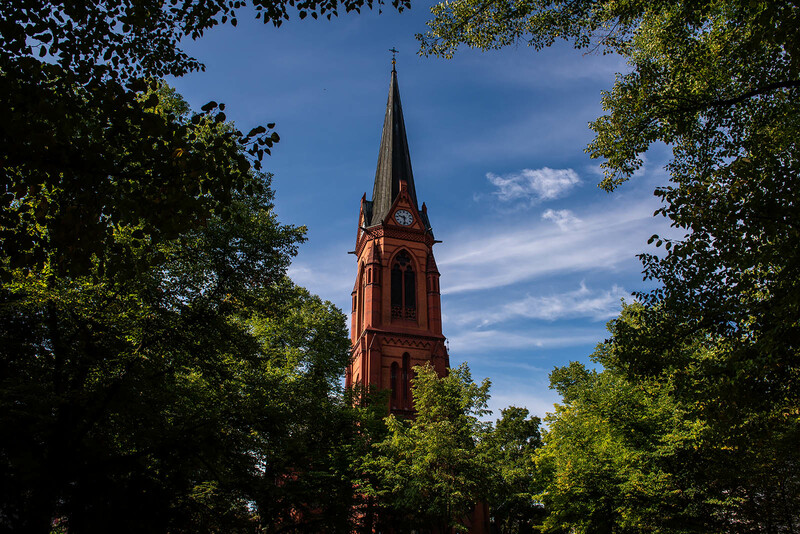 And the congregation of Trinity Lutheran Church in Leipzig welcomes their voices, works to heal their wounds and joins them as they come for God’s Word and Sacraments. Iranian refugees Ahoura and Atefeh sing during worship in Leipzig. Listen as Ahoura, Atefeh and Bijan sing “Nunc Dimittis” in Farsi. The song is part of the Farsi setting for the liturgy by Ahoura and Atefeh. “If you have experienced the love of Christ, why would you want anything else?” said a refugee from Iran, who must remain anonymous to protect her family. The young lady loves Jesus and rejoices that He loves her. She paints to express her faith and to process her pain. 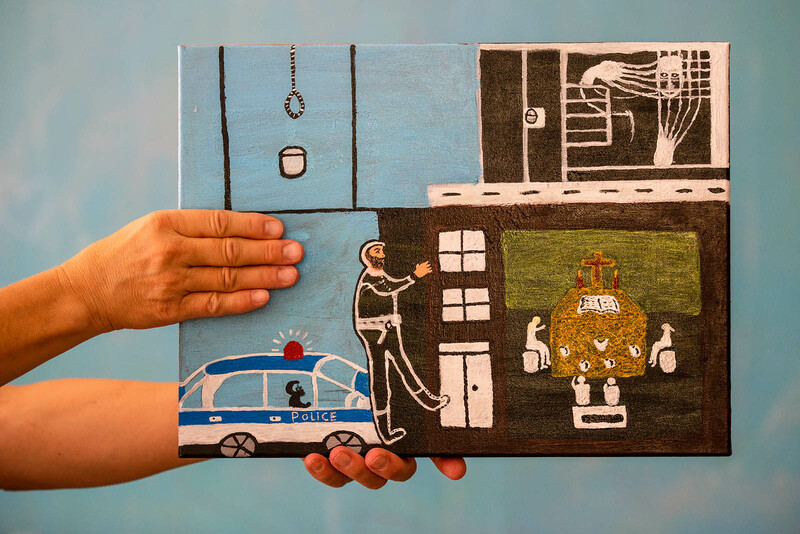 One painting contains frightening images: a police officer spying on a house church, a prison cell and hangman’s noose. The refugees describe meeting in house churches underground. Military officials often showed up disguised as interested Christians. But when they learned the names of the people, they arrested many. In prison, the Christians were severely mistreated. Many were hanged or “released” to be killed on the streets. One refugee shared a story about his brother, who was arrested, incarcerated, released and then found mutilated. In another story, the pastor of the house church was arrested, and the members were told that their names were now known and they must flee the country. A young girl described how men assaulted her repeatedly and left her in the wilderness. As she sat with her mother, tears and fear covered her face. The refugees tell stories of terror and unbelievable cruelty. Yet they insist that the people of Iran are not bad, but the Muslim regime is cruel and has ruined their country. Islam is forced upon the citizens, with the choice of belief or death. A young woman related that after learning Islam, she decided she would rather have no religion than the God of the Quran. Her cousin told her about Christianity and invited her to church. She said the people there were different, that Jesus taught forgiveness, and that changes everything. The refugees journeyed through Turkey, Croatia, Greece, Hungary, Italy and other places until they landed in Germany. One related the story of a shipwreck in the Mediterranean Sea, when 35 people were saved from the cold waters. Some walked and hid in forests and sewers to avoid being found by Muslims hunting down Christian refugees fleeing the Middle East. Germany offers refugee status and assistance to those fleeing Iran or other places. 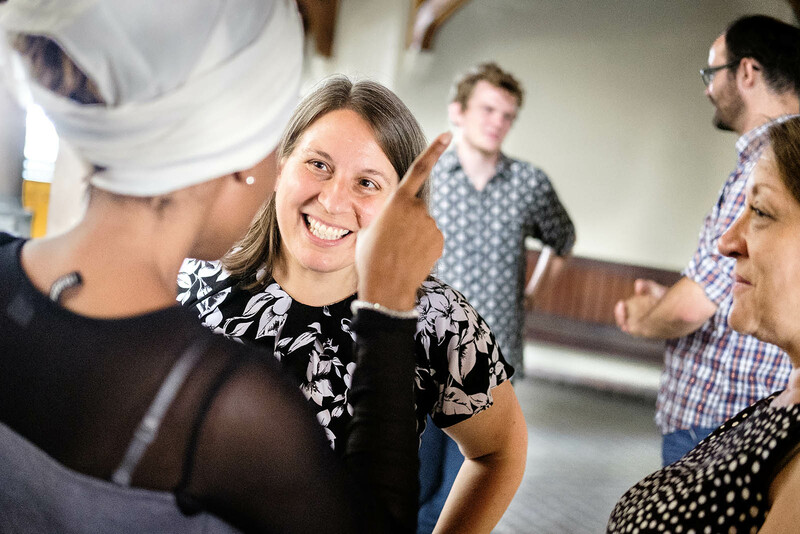 In the Saxon cities of Leipzig, Dresden and Chemnitz, the Selbständige Evangelisch-Lutherische Kirche (SELK), a partner church of the LCMS, works with refugees to teach the faith and help them adjust to life in Germany. Baptism classes attract refugees, since it is one activity the government approves for refugee status. Many of the refugees, even the Christians, are not baptized. In Chemnitz, more than 30 refugees gathered one day to hear about the Lord’s gift of Baptism. The Rev. Stefan Dittmer, pastor of Trinity Lutheran Church, Dresden, taught about sin, guilt and God’s love in Christ. He explained that God’s love is for the whole world in Christ, and that in Baptism it is for you, for each refugee. The Rev. Stefan Dittmer, pastor of Trinity Lutheran Church, a SELK congregation in Dresden, Germany, leads a Baptism instruction class in Chemnitz. 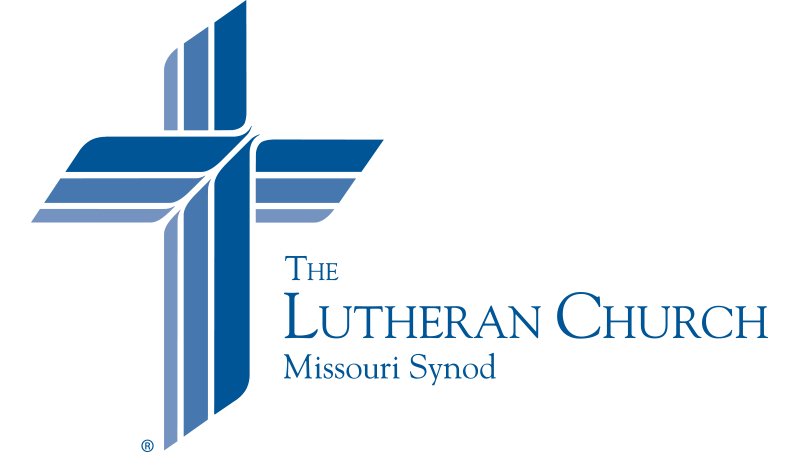 LCMS missionaries work alongside SELK congregations and pastors. Bueltmann and Christiansen work closely with SELK missionary Rev. Hugo Gevers, who serves alongside the Rev. 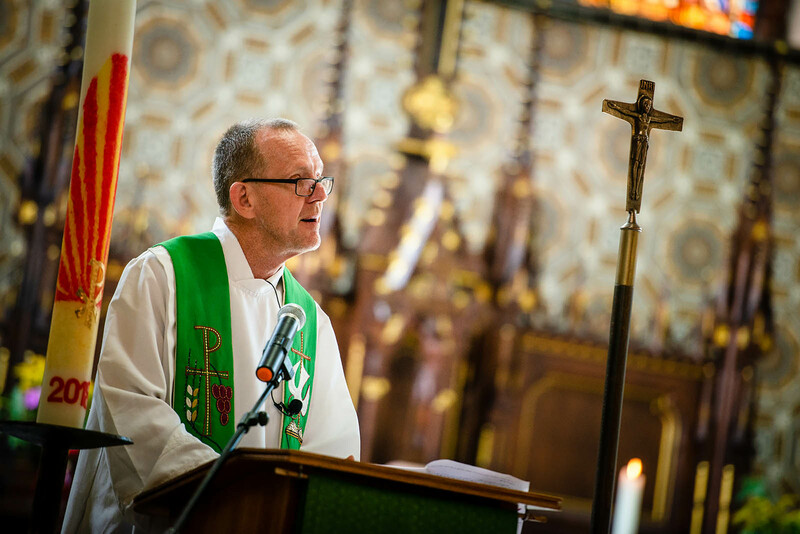 Markus Fischer, pastor of Trinity in the renovated historic St. Lukaskirche in Volkmarsdorf, Leipzig. The Cecils build relationships with refugees in Dresden and Chemnitz, working alongside Dittmer in Dresden. There also are other outreach activities occurring through the SELK, including two small house churches in Borna, Germany. 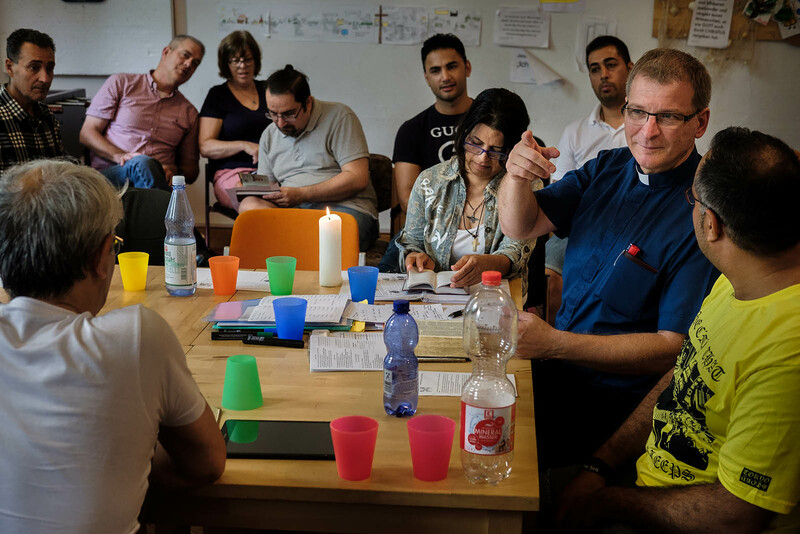 “There are really very few churches who are doing mission work among the migrants,” said Gevers, who works at Die Brücke. Gevers is able to speak Farsi, the native tongue of many of the refugees. When he first came in 2006, he quickly observed that it would be necessary to learn their language and culture in order to communicate the Gospel with the migrants. “Many come to us because they know we talk in Farsi,” he said. The Rev. Hugo Gevers preaches during worship. Gevers provides sermons in Farsi for the churches in the area, but this is not easy. He spends about six hours a week translating his sermon, which he writes in German, into Farsi. That sermon is then emailed to over 200 people and churches for use. Trinity, Leipzig, offers Farsi and German services every Sunday at St. Lukaskirche. On most Sundays, the early service is in German. A coffee hour and then a service in Farsi follow. While people do interact during the coffee hour, the congregation is working to bring the Farsi and German people closer. To that end, one Sunday a month the congregation offers one service in both Farsi and German. The steeple of St. Lukaskirche in Leipzig. Some Lutheran materials have been translated into Farsi, with more work on the horizon. Over 7,000 copies of Luther’s Small Catechism in Farsi have already been distributed. The SELK works hard to minister to the German people as well. Refugees, Germans and all who come to church or an outreach center are welcome. The work is not always easy, and it’s rarely glamorous. Yet with the promises of God, their work is bearing fruit, as He works through His Means of Grace. “Every Sunday, it’s like Pentecost — different languages, all hearing the Gospel,” observed Christiansen after the combined Farsi/German service in St. Lukaskirche. No matter the language, God speaks His Son into sinners’ ears even as He has washed them into His death and resurrection and continues to feed them with the bread of life. Refugees. Native Germans. Missionaries. Visitors. All are drawn to the beautiful renovated church because the bells ring again. All hear Christ. In Leipzig, Jesus is the bridge. Not in the way many picture, as the One who opens the possibility of God to the world, but as the One who bore our sins in His body and gives us eternal life. You promise, O Lord, to be with Your Church and to call people to repentance. Many throughout our world face persecution for their faith and flee to find refuge in foreign lands. Just as You were with Israel as they wandered in the wilderness, so be with immigrants and refugees through Your Church. Bless especially those in Germany who proclaim the Gospel to those in their midst. Restore also the church there, which has weakened. May all find shelter in Jesus Christ, our Lord. Amen.